Used Allworx phone system. Sell buy refurbished Allworx Telephones. We will pay you top dollar for your used Allworx phone system and Allworx phones. Just contact us today to sell used Allworx phone equipment in good working condition. We pay for freight. Call 1-888-234-4975 for more details. Buy Allworx phone gear. 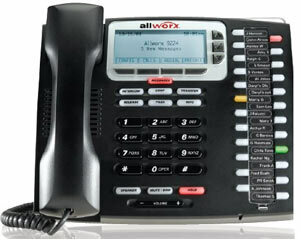 Buy Allworx IP Phones and Business Phone Systems. Allworx telecom gear is perfect for small businesses, large businesses, and anything in between. Allworx IP Phones offer flexible design options with up to 96 programmable keys, full speakerphone, large easy to read display, fixed easy-to-read feature keys? Portability between home, office and remote sites? All Allworx phones offer all these features and can be installed either locally or remotely with any broadband data connection. We can quote an existing system configuration or design a refurbished Allworx phone system to fit your needs. If required, we can install your refurbished used Allworx telephone system through our nationwide network. Visit pages below for your used Allworx phones needs.